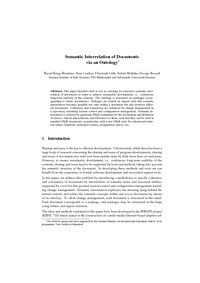 This paper describes how to use an ontology for extensive semantic interrelation of documents in order to achieve sustainable development, i.e. continuous long-term usability of the contents. The ontology is structured via packages (corresponding to whole documents). Packages are related by import such that semantic interrelation becomes possible not only within a document but also between different documents. Coherence and consistency are enhanced by change management in a repository, including version control and configuration management. Semantic interrelation is realized by particular LATEX commands for the declaration and definition of classes, objects and relations, and references to them, such that they can be used in standard LATEX documents, in particular, with a new LATEX style for educational material (slides, handouts, annotated courses, assignments, and so on).